2nd avenue PBL extension plus Citbike to 125th will result in a delightful critical mass of commuter cycling next Spring. I predict a doubling of cycling trips on UES from current 10,000 to at least 20,000. What part of that is vision zero? “Well, once enough people have died, then we’ll complete the bike lane.” NYC DOT is constantly treading on eggshells to not inconvenience drivers in the slightest. NYC’s Vision Zero is a f*cking joke. Can’t wait for 2026 for a low-stress commute. So, he’s basically excusing NYPD for basing enforcement on an old lady’s anecdote about not being injured by a cyclist instead of calling them out. Well, the writer downplays its odds, but this might qualify as the single most forward-thinking piece of transit news I’ve read this year. How about that? An idea actually addressing a pressing need! I agree the gap needs to be filled, particularly because it discourages people from riding there. But putting things into perspective, when was the last time someone was killed in one of these Manhattan protected bike lane gaps? 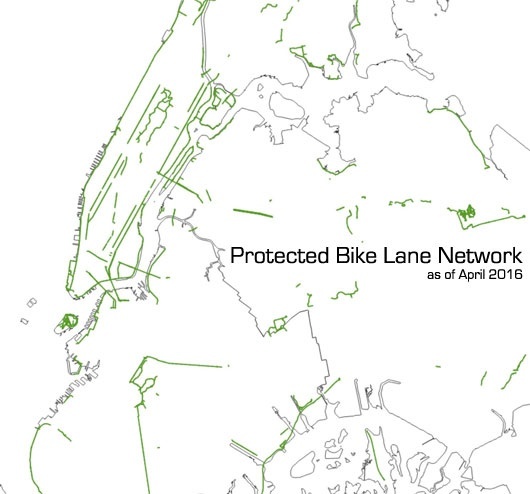 Keep in mind that 90% of cyclist killings occur outside Manhattan. Maybe it would be a better safety investment to expand the network in the other boroughs first. I say this as a Manhattan resident who only ventures into the other boroughs by bike maybe twice a year, so I would personally prefer Manhattan improvements! That’s a good point, but I still can’t understand how slowly DOT installs protected infrastructure (especially versus how quickly they rip it out). The 1st ave bike lane empties out cyclists into 2 lanes of turning traffic (and 3? of straight traffic) on an uphill in a location where drivers tend to speed and suddenly merge as they dive for the turn lane or to get around turning cars. It’s such a no-brainer for DOT to fill in these couple blocks and their refusal to do so, knowingly (As russo admits) putting cyclists into danger makes me think DOT doesn’t give a flying f*ck about increasing bike modal share or actually reaching vision zero. In the European context you’ll have a compact city, then an open space, then another compact city, with a need for links. To do things like that here would be a right-of-way challenge, But the Hudson River Greenway is in essence a feeder route for other bicycle paths; Ocean Parkway could also function like a bicycle speedway, but it doesn’t have grade separation. Well, is there any good reason why bikes shouldn’t have a grade-separated “speedway” given that we’ve done this for cars since at least the 1930s? He seems enthusiastic about the possibility of extending the Vanderbilt Motor Parkway into Nassau County. Why not do a lot more of the same within city limits? Now that we have the Queens Boulevard Phase 2 under construction, which will extend the bike lane from 74th Street to Eliot Avenue, if someone wants to commute from Elmhurst to Manhattan, the ease is transformative. Those eight to nine miles: that’s the long-distance-biking potential that we are working on facilitating. But it could be so much better is we at least had overpasses at the major Queens Boulevard intersections plus a flyover connection to the Queensboro Bridge to make it a non-stop route all the way. I guess he doesn’t realize how long the light cycles are on Queens Boulevard, and how often cyclists get caught at virtually every light. So we base police enforcement on anecdotes instead of statistics? Did it ever occur to him that sometimes people who hate bikes just make up stuff like this to spew at community board meetings? And did it ever occur to him that perhaps DOT should get on the side of pushing for changes in the law to legalize things like passing red lights at empty intersections (for both cyclists and pedestrians) and legalizing sidewalk cycling in places with relatively uncrowded sidewalks? It would be wonderful if Nassau County got excited about putting it together. But you have to be cognizant of the distance. It’s a lot of miles from Nassau County into the city. That’s where e-bikes and even velomobiles come in. However, with velomobiles especially they don’t really come into their own unless you have bike infrastructure where you can get up to speed and stay there. A velomobile on regular NYC streets would be no faster than a regular bike. However, on dedicated bicycle highways it could be 1.5 to 2 times as fast, depending upon design. Overall, I was encouraged by most of what he said, but he appears to be unaware of the huge potential of human-powered transportation. We can do much better than assuming bikes are only useful for 1 to 3 mile trips. There’s a bit of chicken-and-egg insanity to Russo’s response. On one level, he’s not wrong. More people will continue to take up biking, which will make installing more bike lanes easier. But installing more bike lanes will get more people biking, which seems like a better way to do things since it also winds up protecting the people already out there. Shorter Russo: the politics of it all are hard and prevent us from doing more, but we’re also a little afraid of changing the politics by just doing more. Could it reduce short term demand enough to close the existing bus terminal for about as many years as the L train shutdown (or 20, given the consultants and other mafia) and rebuild it in place? That is the question. And what is the marginal cost of than connection compared with Gateway, if a tunnel is to be sunk in the river and TBMs run through the palisades? Consider that a #7 train extension to Secaucus can do more than just replace a lot of PABT trips. It can also replace a significant number of trips done on NJT, perhaps eliminating the need for many NJT trains to do a time-wasting stop at Secaucus Junction. I think they want to do more, but they don’t have a mayor who’s willing to take the heat. You’re definitely right about that, but DOT has so many opportunities to maintain/protect bike infrastructure (even just with flexposts) that they don’t take. I suspect it’s because the cult of the car is alive and well at DOT. The big problem would seem to be what to do with afternoon/evening outbound commuters. For people coming in, a terminal may not be needed. They can get off their bus and diffuse wherever they need to go (walk, take the subway, etc.). Not sure whether the reverse would work because of crowding. Commuter buses don’t really load quickly, so you’d have queues on the street. Why compare it to Gateway? It’s not competing with Gateway. They say Gateway would still be built. The idea is an alternative to moving the bus terminal west and/or spending $10B on a bus terminal. I guess the marginal cost of that is ($10B – whatever this costs). Is 2nd Ave fixed, or is it about to be fixed? Been avoiding it. The new 1st Ave two-way bike lane has still yet to receive its jersey barrier between E 124th and 125th Sts. Someone put out a cone not to long ago because some cars will still cutting into it during left turns to E 125th. The Bruckner Blvd greenway is finally complete, but the lane marking are wrong on Hunts Point Ave due to a pedestrian island that should have been extended further considering the city has planned this bike lane. Theres also no good way to transition to the plaza surrounding the Hunts Point Ave train station, in order to continue traveling up Bruckner Blvd. Could you leave your comment on the http://urbanomnibus.net/ website? They will probably read it, only a few people comment there. Have you ever actually ventured down to the 7 platform buried under Grand Central? Can somebody explain to me how the hordes from the bus terminal are going to fit down there? Heh, the old “don’t build it, too many people will use it” argument. Devastating, especially when combine with the “don’t build it, nobody will use it” argument. You can achieve any result you want! Some of those “hordes” already must use it. But to answer, it’d probably be necessary to know the current capacity limits and how many more users you think would use specifically GCT. I would want to understand what it means to dig into what is already a dangerously crowded complex while it’s in operation, what the user experience would be in the final configuration as well as during construction, and what the price tag would be for that venture. Maybe it’s great… but it seems hard to see. When people make it sound like it’s just going to magically work well, I start to get scared. Dig in to what? Are you talking about PABT42? That must be replaced period. For Secaucus’ sake, I’m sure the GCT crowding must be studied, but would guess the extreme case is a negligible increase in platform crowding. GCT’s appeal for eastbound riders can’t be very high. Bryant Park is closer to jobs along the 7 Train, the E Train provides access to the more job-dense part of Midtown East. The SAS will offer for faster access to the UES (which will probably offer at least negligible relief to GCT’s 7 platform). If there is a danger here, maybe it is in the combined effect of platform strains added by both PABT and LIRR/ESA users?